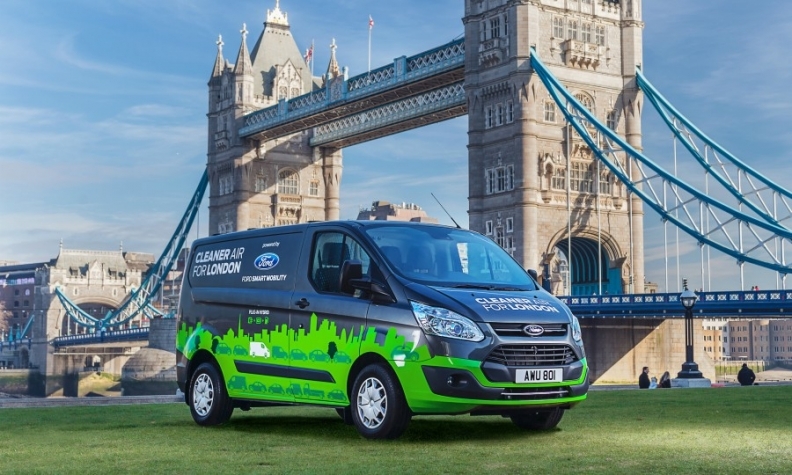 Prodrive is working with Ford to develop the plug-in hybrid version of the Transit Custom van. Ford is testing the vans in London as well as Valencia, Spain, and plans to offer the production model next year. It was a moose that convinced British engineering company GKN that electrification should be the focus of its automotive business. It wasn't actually a live animal but the infamous "moose test" conducted by Swedish journalists in 1997 on the first Mercedes-Benz A class. The A class — Daimler's first modern small car, which was coming to market with much fanfare — tipped over during a maneuver meant to simulate avoiding a large animal crossing the road. At the time, GKN was heavily involved in making viscous couplings. But the fallout from the A-class rollover led Mercedes and other manufacturers to equip their vehicles with electronic stability control systems that were not compatible with GKN’s couplings. Although not involved with the A class yet recognizing a threat to a core business offering, GKN started to develop mechatronic and electrified systems that were compatible, said Peter Moelgg, CEO for all-wheel-drive and electric-drive systems at GKN. Fast-forward to 2018, and GKN now has 3 billion pounds' (3.4 billion euros) worth of electric-drive orders on its books, up from 2 billion pounds (2.7 billion euros) a year ago. The company is a leader in electrified axles for premium and high-performance cars such as the Porsche 918 and BMW i8 and even London taxis. "We realized that there were problems that didn’t have mechanical solutions," said Moelgg, who has been with GKN since 1979. The company, which Melrose Industries recently acquired in a hostile takeover, ranks 37th on Automotive News Europe's list of top 100 global suppliers withsales of $6.74 billion in 2016. GKN is one of a number of suppliers profiting from the auto industry's move toward electrification in the face of tightening emissions standards and local pollution regulations. Electrification – from drivetrains to smaller components such as heaters and suspensions – is shaking up the supply chain, analysts and industry executives say. That leaves an opening for small, agile companies to develop specialized components and forces larger ones to confront their future. Punch Powertrain, a Chinese-owned transmission supplier based in Belgium that produces about 1 million units annually, has taken a winding route to develop those competencies. But it appears to be paying off. The company started as a subsidiary of Dutch truckmaker DAF, then Sweden's AB Volvo, and eventually was taken over by German supplier ZF Friedrichshafen in the late 1990s, when it began to develop hybrid and electric technologies. Then, in 2006, it was acquired by Punch International, a Dutch company, with the goal of bringing a hybrid vehicle to market, said Gert-Jan Vogelaar, Punch's strategic marketing director. That never happened because of the economic crisis and other factors, Vogelaar said. The company changed hands again before being acquired by the Yinyi group, a Chinese company, in August 2016. Yinyi has been "very supportive" of developing electrified components, Vogelaar said. And at the beginning of May, PSA Group announced that Punch Powertrain would be providing continuously variable transmissions for 48-volt mild hybrid applications in the group’s vehicles starting in 2022. This year, Punch will be bringing to market a complete electric powertrain, featuring a motor of its own design. "By 2025, we expect that more than 50 percent of our business will be in electrification," Vogelaar said. In the short term – perhaps the next 10 to 15 years – automakers will be deploying many types of electrified drivetrains tailored to specific markets. Rather than spending resources to develop specialized components that may be produced in relatively small numbers, the auto companies are turning to suppliers or engineering consultancies. One such company is Prodrive, based in Banbury, England. Prodrive made its reputation building rally and racing cars but in recent years has branched out into engineering with an emphasis on electrification. David Taylor, the company's managing director for advanced technology, said about 65 percent to 70 percent of Prodrive's nonracing automotive business is in electrification. "We are an innovative engineering consultancy, which means we have got to stay at the forefront of those industries that we are working with," Taylor said. "So, for electrification, when auto companies are first talking about it, we want to be in on those conversations." Prodrive's first major electrification project came in 2001 when it built a hybrid test vehicle for Saab. In 2016, the company landed Ford Motor as a client to develop the plug-in hybrid electric Transit Custom van. Prodrive's tasks, with an 18-month time frame, included integrating a nonstandard internal combustion engine as a range extender, a high-voltage battery and control system, an electric motor and axle, a heating/ventilation and air-conditioning system and supporting systems. Many of the components came from different suppliers. The body-in-white needed to be modified, and engineering work had to be validated for public road trials with nonexpert drivers. For Drive System Design, an engineering company with about 115 employees in offices in Coventry, England, and Detroit, the need to move into electrification became apparent about 10 years ago when it landed a contract to help a German automaker with a "significant" noise, vibration and harshness problem in its first hybrid vehicles. "We were able to solve their problem," said Mark Findlay, Drive System Design's managing director. "We got involved in their subsequent electric and hybrid vehicles, and we have been doing work for them ever since. For a little UK consultancy, as we were then, to start getting work from a premium-segment automaker convinced us electrification was a good plan." As with Prodrive, about 70 percent of Drive System Design's work is in electrification. "We are probably working on a dozen different electric-drive-unit projects," Findlay said. Among them are a design review and manufacturing strategy for a Tier 1 supplier that will be delivering half a million units a year to a German automaker. Both Taylor of Prodrive and Findlay said their growth was constrained only by their ability to hire qualified engineers. 2We are getting inquiries at least once a month from companies that want to build an electric vehicle," Taylor said. "Getting good engineers is hard when there is so much engineering going on with the existing automakers and new entrants to the market." He also noted that other industries, such as aerospace, were also moving further into electrification. Eichenberg, the consultant, said even bigger changes are ahead as battery electric vehicles gain significant market share in the next 15 years or so. Much of the value in the vehicle will be in software and semiconductors, two technologies dominated by companies outside the traditional automotive supply chain, such as Toshiba, Panasonic and LG. GKN, for one, hopes it will be one of those winners. "We worked very hard on the transition" to electrification, said Moelgg, the head of electric drive systems. "It definitely changed the way we worked and hired engineers and programmers."